Dundee City Council has agreed the SNP's proposals to make £10.3m of savings to its budget. · Selling Dundee House to the Tayside Pension Fund, before leasing it back. · An annual charge of £35-per-household to have brown bins emptied. · Voluntary redundancies offered, including in schools and nurseries. · Reorganisation of staffing structures to try and save £2m. Dundee City Council budget meeting: EIS rep David Baxter said there is widespread anger amongst teachers over council proposals. There's a packed chamber five minutes before the much anticipated budget meeting begins. The public gallery is full, with some even standing. Removing the funding for Police Scotland activities which "should be funded from their £1.2bn annual budget"
Dundee Labour's Kevin Keenan said "This is a truly dreadful SNP budget from a party that has let Dundee down again..."
Dundee City Council’s policy and resources committee is meeting to set its budget. Opposition parties will submit their own proposals. Liable to get tetchy. Leisure and Culture Dundee will meet next week to discuss how it can meet the cut to its budget likely to be imposed. Price increases seemingly inevitable. Council leader John Alexander says one-off savings don't help long-term and simply "Kick the can down the road". Derek Scott of the Lib Dems claims the administration made changes to its budget without letting the other parties see them. Fraser Macpherson said, re: parking charges: "I despair at the lack of consultations....utterly dreadful"
Labour's Michael Marra says this is the "Worst budget in living memory"
Deputations now starting. Stuart Fairweather from Unite is first up. Stuart Fairweather branch chairman of the Unite union "We think the budget proposals should be rejected and DCC should establish a 'no cuts' budget"
Stuart Fairweather: "Local democracy is under threat in the same way industrial democracy is under threat"
Fairweather says cuts to education are ‘absolutely horrific’. SNP councillor Ken Lynn says administration has been resolute in seeking additional funding for Dundee but ‘we are where we are’. 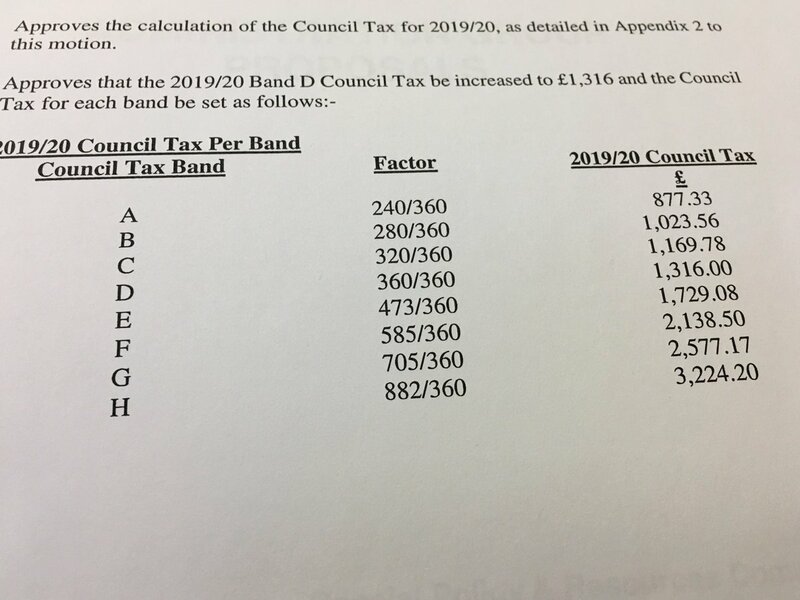 Stuart Fairweather says that postponing the Budget meeting would be preferable to "inflicting millions more of cuts on the hardest hit communities of Dundee"
SNP councilor Alan Ross says to Stuart Fairweather: "I agree that this can't continue.... what do you think the answer should be?" Stuart Fairweather says the action to be taken is to reject the cuts then enter discussion with Holyrood....or suggests councillors should resign. Raymond Mennie leads chants of "Shame, shame, shame on you!" as he points at the administration councillors. Communist Party member Raymond Mennie now giving it laldy. Says Brexit will be great for workers and V&A Dundee is ‘bourgeoise culture’. Dundee branch of the Young Communist League up next. Two thirds of EIS members in Dundee have signed a letter opposing the council’s proposals in just 48 hours. Michael Marra of Scottish Labour says the documents show the council is "abandoning attempts to close the attainment gap"
David Marra if this goes through today we will be in dispute by tomorrow morning. EIS will be in dispute with council ‘tomorrow morning’ if local authority presses ahead with plans to move to school faculties, warns David Baxter. Ken Lynn asks if Helen Meldrum feels he, as an SNP councillor, "has no conscience"? She replies that if the budget goes through, then she believes he doesn't. John Alexander says he and his fellow councillors "care about every single person in this city"
Councillor Alexander says the administration's Budget is "the most sensible and pragmatic way forward"
Council leader John Alexander says budget is not easy and administration is ‘not happy’ but it is ‘the most sensible for Dundee’. Lib Dem group leader Fraser Macpherson says that "however you look at it there are bad things in everyone's budget" and he "doesn't have a magical solution"
Fraser Macpherson says he "knows and likes" every member of the council and knows they "all have decency in their hearts"
Labour group leader Kevin Keenan says Labour cannot support the Lib Dem group's budget, as it "doesn't go far enough"
Ian Borthwick there has to be closer liaison with trade unions. SNP councillors are now taking turns to list council achievements over the past year. Labour group leader Kevin Keenan urged the administration to ‘put on your listening ears and listen’ to concerns about their proposed education cuts.